Holy Diver is a Mega ways (Up to 586,971) paylines and 5 reels video slot game powered by Big Time Gaming software platform. 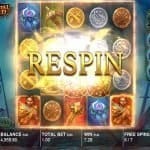 Total coins for the game is 10 and coin size range is 10p per spin to up to €£20per spin. You can win huge money if playing Holy Diver video slot because it offers a jackpot of a whooping 300750 times on your total stake. 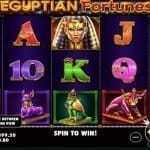 The game contains 5 bonus rounds including Free spin bonus feature. 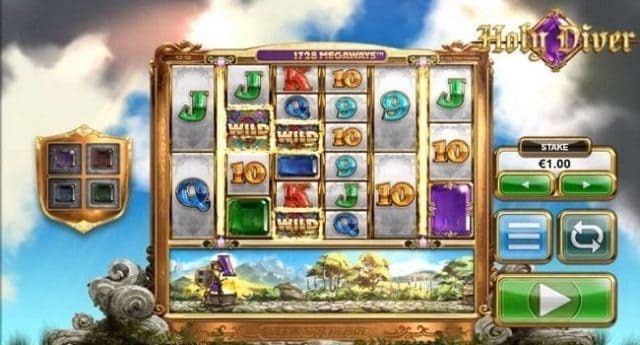 You can play Holy Diver slot at either your mobile phones or desktop. The reels of the game include symbols such as A to 9 royal and 4 gemstones. The purple stone gemstone is the highest value symbol as it offers 15 times on your total stake if you land these symbols across all your 6 reels. Standard Symbol Bonus feature- During this feature 1 of any lower value symbol will be picked randomly and it would be chanced in to a wild symbol. Sword Bonus feature – In this feature up to 3 reels will completely change in to wild reels and will boost all you’re winning up by 7x. It means by combining everything, you would get a good total of 343 times on your total stake during this feature. The next feature is Fireball Bonus feature – This feature will turn adjacent reels in to wild. Gem Symbol Bonus feature – This feature is activated when one of more gemstones turn into wild. 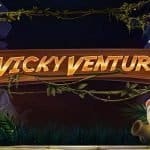 You would receive 10 free spins if opting Free Spins feature.